The devastating floods in Pakistan in 2010 and Hurricane Katrina in the USA in 2005 highlighted the possibility that climate change, manifested in extreme weather events, is with us now. This shattered any remaining complacency that it is a problem just for future generations. Meteorologist and former hurricane hunter Dr Jeff Masters argues that “it is quite possible that 2010 was the most extreme weather year globally since 1816”. Although some think these were isolated events unconnected to environmental changes, research after Katrina in particular made a strong case that the warming of the ocean was leading to more severe hurricanes. There is now sufficient evidence for climate scientists to call for extreme weather events to be considered as related to global warming until proved otherwise, rather than the other way round. There is a wide range of predictions of possible temperature rises linked to global warming, because estimations depend on assumed sensitivity of the earth to rises in greenhouse gas concentrations. Sensitivity to greenhouse gases is not yet fully understood, but if the upper end of estimates, 13.3°C, proves to be true, it will be difficult for life to be sustained on the planet. Although this extreme outcome is statistically unlikely to happen, it is nevertheless a warning of the profound dangers we face. A recent lower prediction that is much more likely, which would nevertheless still be devastating, is for a rise of 4°C by 2055 made by the UK Met Office, a leading authority in climate science. The Stern Report into climate change, commissioned by the former New Labour government and then ignored, assuming a 2-3°C rise, also predicted more frequent droughts and floods. In addition, Stern warned of declining crop yields and fish stocks and from tens to hundreds of millions flooded out of their homes. Climate change will also increase deaths from malnutrition, heat stress and diseases such as malaria and dengue fever. In a nutshell, the effects of global warming will be devastating and borne mainly by the poor. Apart from global warming, the other significant dangers we face are pollution linked to nuclear power generation as well as from many other sources. Deforestation and desertification threaten the environment and the lives of the poorest on the planet, both phenomena being linked to global warming, as is accelerating species extinction. The oceans and the living organisms in them are under attack from many directions. This includes fish destruction and toxic pollution from various sources, not least oil spills, highlighted by the Deepwater Horizon disaster in the Gulf of Mexico in 2010. When the scale nine earthquake struck just off the coast of the Japanese city of Sendai on Friday 11 March 2011, the seismic shock was immediately registered by the sensors at the Fukushima 1 nuclear plant, which is situated on the coast, south of the epicentre of the quake. The reactors were shut down as a ’precautionary measure’. Dozens of pro-nuclear experts then kept assuring TV viewers that ’everything was under control’. Unfortunately, the earthquake was followed by a tsunami, which easily overcame the coastal defences around the plant and inundated the reactor buildings, putting the diesel generators out of action. Fukushima 1 had six reactors, three of which were operational at the time of the earthquake. There was a meltdown of the nuclear fuel in reactors 1, 2 and 3. The buildings housing the reactors 1 and 3 were destroyed by hydrogen explosions, as steam was vented into these areas from the containment vessels. The resulting radioactive fallout was the worst since the 1986 Chernobyl catastrophe. There was a scandalous lack of data made available by the private operator, the Tokyo Electric Power Company. This organisation had, in the late 1980s and 1990s, been found to have systematically falsified records of safety problems at its nuclear reactors. It also admitted being unaware that its Kashiwazaki Kariwa facility was built immediately above an active fault line, where four tectonic plates converged. When an earthquake hit that nuclear plant in 2007 it was put out of action for two years. Nine months after the Fukushima disaster, the Japanese government finally announced that significant radioactive leakages had been stopped, although it would take 40 years to clean up and decommission the plant. In the long term, storing the toxic waste produced by nuclear power generation is even more of a problem than coping with a disaster like Fukushima. This is because the waste will be radioactive for 100,000 years and no completely safe method of storing it has yet been devised. Thousands of toxic substances produced by the world’s chemical industries are released every year, which threaten the earth’s air, land and sea. Some discharges hit the headlines, like oil spills or the leaks of radioactivity at Fukushima. However, the volume of contaminants released in less dramatic circumstances far exceeds these high profile cases and overall more damage is probably caused. These cases include industrial discharges, sea dumping, spillages and the effects of pesticides and synthetic fertilisers. The release of genetically modified organisms (GMOs) must also be added to the list of potentially dangerous contaminants. Genetic engineering has the possibility to transform medicine and other aspects of our lives for the better, but its main application to date has been driven by agribusiness to generate quick returns. Since the long term effects when this happens are still not clear, they should not be deployed in agriculture until there is sufficient scientific knowledge to permit their safe use. Deforestation, destruction of sea life and species depletion are examples of the accelerating degradation of the natural world. The Amazonian rainforest has shrunk by 15%, the Indonesian rainforest 72%, caused by the encroachment of agricultural land for cattle grazing and particularly for soya and palm oil production. It has been claimed that the biggest single threat to the marine ecosystem is from over-fishing. Modern factory ships, using sonar technology to detect shoals and massive trawling equipment that can reach the sea floor, are destroying whole populations of fish. 90% of large fish such as tuna, cod and halibut have been wiped out, which is causing a shift in the ocean ecosystem to one in which small plankton eating animals predominate, such as jelly-fish. Tens if not hundreds of thousands of jobs have been lost as the Newfoundland, North Sea and Baltic Sea fisheries have largely collapsed. The attention of the big companies has now turned to the Pacific, the only remaining area not yet fished out, but the same fate awaits this region as befell the North Sea, if the present profit driven approach is not fundamentally changed. Unless this happens, all that will remain on the menu before long may be jelly-fish and chips! Deforestation and fisheries depletion are part of a wider picture of habitat destruction that is driving the reduction in biodiversity. 20,000 species a year are being lost according to Douglas Crawford-Browne, director of the Cambridge Centre for Climate Change Mitigation. He and most environmentalists blame this situation on ’human action’, but in fact it is a very particular form of ’human action’ that is in the dock: the pursuit of profit in a capitalist market economy. The vast majority of the problems discussed here can be traced back to the detrimental activities of big business, particularly multinational corporations and their agents. How green will the capitalists go? Like many previous summits, the 2011 UN sponsored climate change conference in Durban, South Africa, abjectly failed to reach an agreement to tackle global warming. The conference ended with just a hope that a new and as yet unspecified agreement to replace the Kyoto climate reduction treaty, which ends in 2012, would come into operation by the earliest in 2020. That is, no new deal will be in place before then. But 2020 is also the deadline given by climate science for cutting greenhouse gases by 40% to avert a potential catastrophe. The wording agreed to form a legally binding basis for a future treaty was so vague as to be worthless. Recent follow-up talks in Bonn ended on 25 May with more disagreements and backtracking, putting even a vague treaty in doubt. The failures of the Durban summit and its predecessor at Copenhagen in 2009, gatherings that were meant to correct the failings of Kyoto, showed the inability of the capitalist class to tackle global warming. In advance, the UN had called the Copenhagen conference the last chance to avoid catastrophic global warming. In the event it just revealed the deeply antagonistic relations between the big powers preventing agreement on climate change. Directly applied carbon taxes, as many Greens advocate, could have a bigger impact than a Kyoto type system on greenhouse gas reductions. However carbon taxes would hit the poorest sections of society, since the poor spend a greater proportion of their incomes on fuel. This would especially be the case if taxes were implemented on a scale intended to have a serious impact on emissions. Such regressive measures should be opposed by socialists. 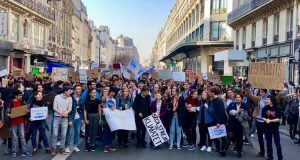 Rather than backing the market-type system discussed at Copenhagen, many activists, seeing the urgency of the situation, are now calling for direct measures to be implemented to reduce greenhouse gases. These measures could include laws to establish a ceiling in emissions by a certain date, with any breach dealt with using criminal sanctions. However, if the world’s ruling classes opposed the largely cosmetic measures proposed at Copenhagen any new approach with real teeth would meet with even more determined resistance. The evidence is now clear that despite their protestations to the contrary, governments in Britain and internationally do not intend to take any meaningful action to tackle climate change. The financial and economic crisis that began in 2007 has made it likely that even token measures, like the Kyoto treaty, will be opposed by most states. For instance the USA, the second highest emitter of carbon dioxide behind China, categorically refused to participate in an international treaty to reduce greenhouse gases, even when it was offered a system at Copenhagen that was full of loopholes. Environmental activists should join with socialists to fight the inaction of the capitalists and their governments. Political lessons must also be drawn from the 20 years that have been wasted by the capitalists in the battle against climate change. Sustainable economic growth on a capitalist basis is not feasible, partly because the methods employed to achieve this are inadequate and flawed, but mainly because imperialist rivalry between nation states prevents the international cooperation needed. At one level, addressing global warming is simple; no technological breakthrough is required. All that is called for is the wider adoption and further development of existing technology, such as wind, wave and solar power. But only by eliminating the power of the big corporations can this programme be realised. This means nationalising the main industries that dominate the economy. This will need to be done throughout the world, encompassing the 147 multinational corporations that recent research has shown dominate the globe. Since the operation of competitive markets degrades the environment, rejecting the market system is essential to tackle global warming. Doing this will require an alternative approach to organising production. Rational democratic planning is not just a viable alternative, it has huge inherent advantages over the market from the point of view of saving energy. For example, it could avoid the duplication of resources, planned obsolescence, and wide-scale destruction followed by rebuilding of factories, plant and machinery in the capitalist slump/boom cycle. Two related factors underlie nearly all environmental threats. They are the quest for profit by big corporations and at a more fundamental level, the inevitable tendency of competitive markets to degrade the environment. The task is urgent. It must involve the political re-armament of the workers’ movement in Britain and internationally with a socialist programme. As a first step, this will require the creation of new mass workers’ parties to replace the discredited former workers’ organisations. 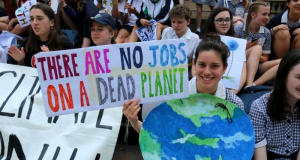 These parties, such as the Labour Party in Britain, have totally failed over decades to implement programmes to reverse the degradation of the planet. By taking no meaningful action for the past 20 years, the representatives of the capitalist market system have created a situation where some of the effects of global warming are irreversible. Regardless of future events, this is a historical indictment, in its consequences possibly ranking alongside capitalism’s greatest crimes, such as the imperialist wars of the 20th century. To avoid the worst effects of climate change, decisive action needs to be taken now, but there is no sign of this happening due to the rivalries between the main industrial powers. 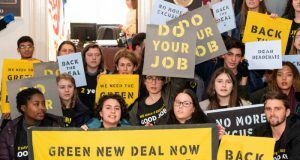 It falls on the shoulders of the international workers’ movement to implement a programme that can tackle climate change – replacing capitalism with a democratic socialist system.